We have a wind farm – and it’s the biggest in the world! We were delighted to see that the new Thanet Offshore Wind farm is now up and running – generating an impressive 300 megawatts of power. Although questions have been raised in the past about the viability of wind turbines as a source of renewable power, it’s clear that the Thanet Wind farm (off of the Kent coast) is already a great success and capable of powering over 200,000 homes when running at full capacity. British waters are perfect for wind farms because they are so windy. 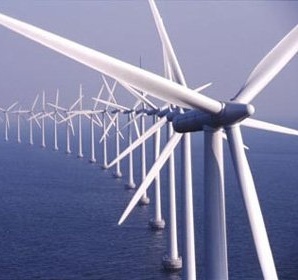 An offshore turbine around Britain is estimated to produce 50 percent more power than a similar one in Germany. Yes, wind farms are expensive to build, at 880 Million pounds the Thanet offshore project may take a long time to achieve “payback” for its investors, but what other options are there? Quite simply, we cannot rely any longer on expensive, imported oil and coal that will continue to pollute our shores before running out completely. The Thanet project helps us on the way to the target level of 15% renewable energy that must be reached by 2020 in the UK and paves the way for an even more impressive offshore wind farm further along the coast on the Outer Thames Estuary. This is expected to power an additional 750,000 homes – clearly great news for the environment and a big step away from our reliance on oil, gas and coal. The Ecopower take on wind farms in the UK? As our supply of fossil fuels continues to deplete and the prices rise, electric heating has to be the way forward. Already electric heating is the preferred heating method throughout much of Europe and we need to catch up quickly. Ecopower looks forward to a clean, sustainable and electric future. Great Project. When it runs with full capacity, It will really provide power to number of homes. I think wind turbines are fabulous. I know a lot of people complain about them, saying that they ruin the lovely countryside, but I think they’re beautiful and when the oil and coal reserves have been depleted, wind turbines are going to be the main provider of energy to our homes. They are starting to build some wind farms on the mountain tops in West Virginia. I can see them from miles away when I’m hiking. It’s amazing to see how big they actually are up close! Thanks for your comments. We like wind farms – they are the only way forward for sustainable energy and another incnetive toward electric heating as a future-proof option, but love them or hate them, wind farms are here to stay. This week saw talk of an even bigger fuding commitment to develop many more on and off-shore wind farms in the UK. We will blog again about this as soon as possible, so keep an eye out! Thank you for sharing superb information. Your web-site is really cool. I’m impressed by the details that you have on this weblog about your electric radiators. Bookmarked this web page, will come back for extra articles. You, my friend, ROCK! What a terrific web site. Thanks for your comments. If you’d like to read more, please subscribee to our RSS feed. Blog subjects include electric heating pros and cons, tips on energy efficiency at home, news and views on current affairs and the politics behind the energy market, and lots more. Subscribe here! It is truly amazing to see all of this renewable energy being used today. I cant imagine 750,000 homes being powered by wind. With new sources of renewable energy being used, it seems likely that other energy fuels such as heating oil will decline in price with downward demand. It will be a win win for all and electric heating will continue to stand firm. Thanks for your comments. Agreed – yes, there will be a natural decrease in the demand for heating oil, but this is what the government is looking to achieve in order to reduce carbon emmissions. Lets’s not forget that the world supply is dwindling and current availability is at an all-time low. Electric heating seems to be far and away the most straight-forward and cosst-efficient way of capitalising on the new renewable energy that we are now investing so heavily in. Our electric radiators bridge the gap perfectly and, of course, electric heating guarantees 100% efficiency and 0% emmisions for the end user. Agreed – win win! I was looking online for tips that can assist me. I’ll call you later to order. Thanks! I have been checking out some of your heating stories and it’s clever stuff. I will definitely bookmark your site. Thanks! Feel free to click on the RSS Feed button for regular updates on our electric heating products. Ecopower Heating have a great team to help you. Definitely, what a great site and instructive posts, I definitely will bookmark your electric heating blog.Have an awesome day!